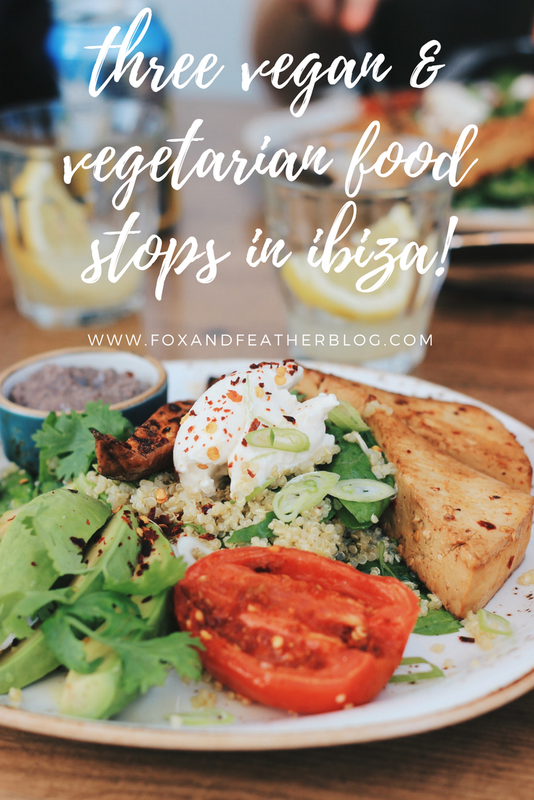 It's been a few months since I visited Ibiza but I've wanted to put together a little guide of the vegan stops we made during our short time on the island. 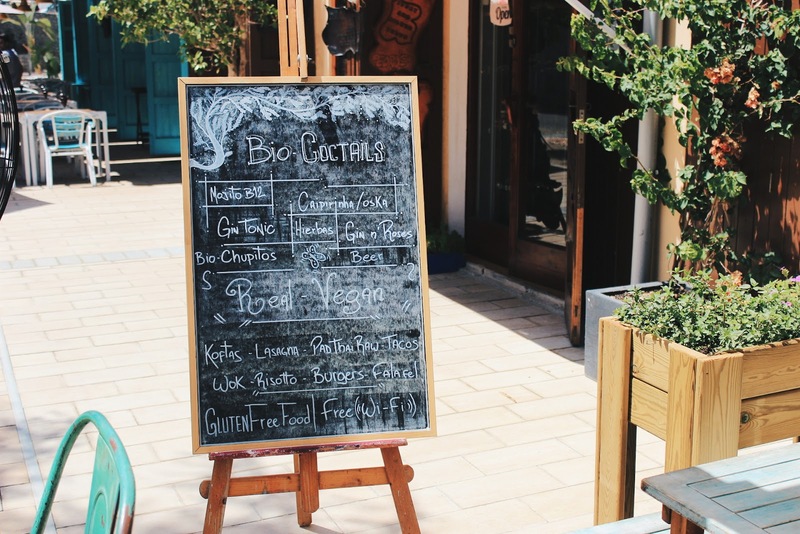 Thanks to Ibiza's holistic and spiritual tendencies, there is quite a high demand for vegetarian and vegan food on the island, so if you are plant-based, you won't have any trouble finding somewhere to cater to your dietary needs. 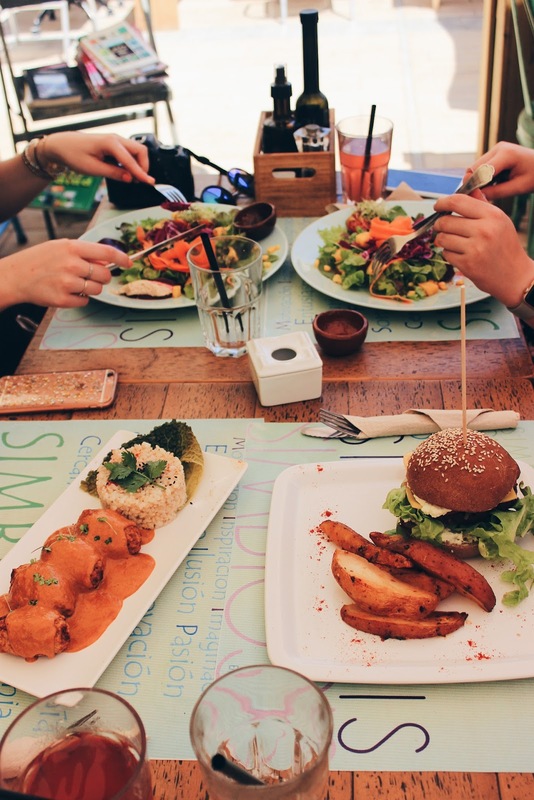 On our first day in Ibiza, we wanted to stay relatively close to our hotel in Es Canar, so upon Lauren's recommendation we drove to Passion Cafe in the nearby town of Santa Eulària. 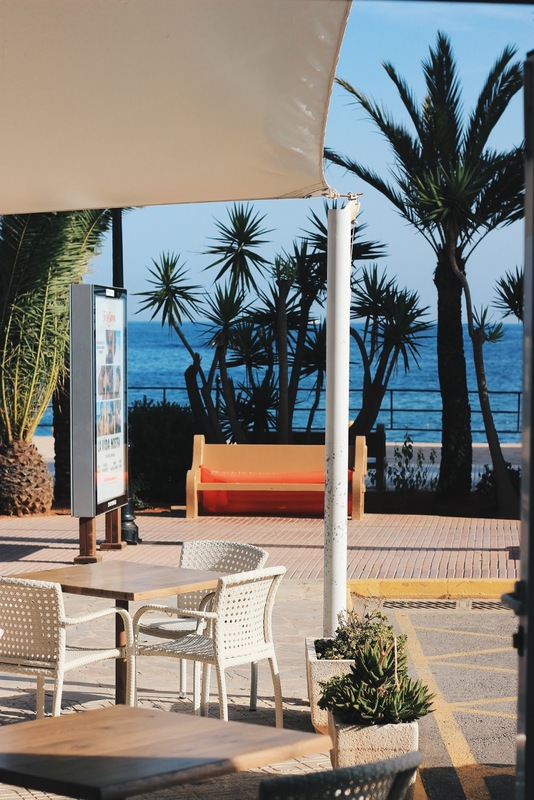 Passion is pretty well-known amongst regulars to the island and has six cafes across Ibiza, but the Santa Eulària eatery is sat right on the waterfront with a scatter of tables dotted around outside of the cafe where you can enjoy the sea view whilst enjoying your meal. 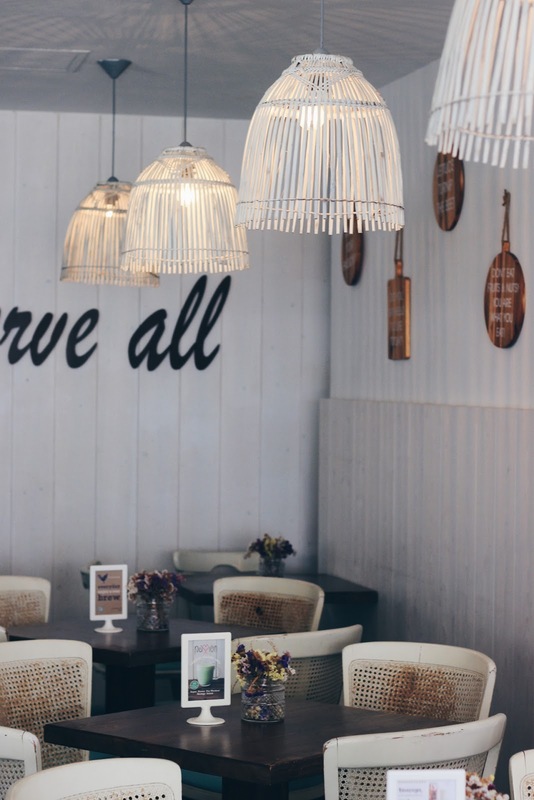 The interiors of the cafe are very quaint and very shabby chic, with white wooden panelled walls and vintage decor. 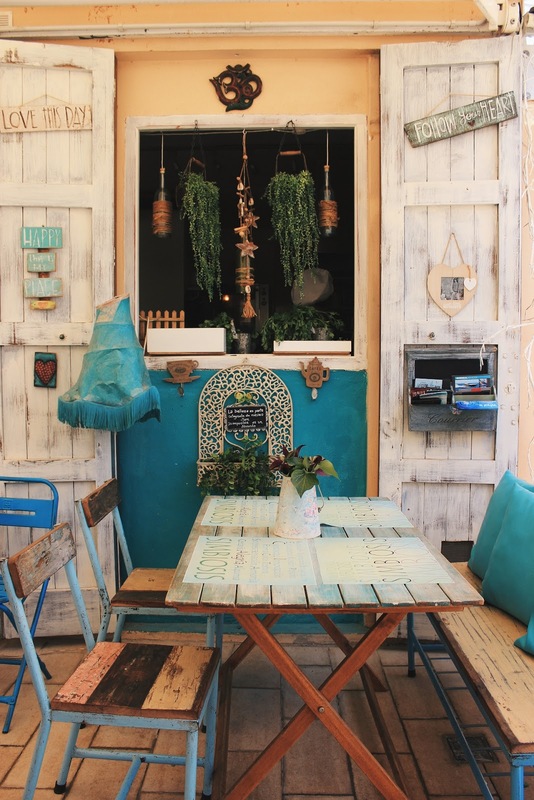 Like most establishments in Ibiza, the cafe is bright and welcoming with its doors thrown open to draw in the inevitable sunshine (because it's always sunny in Ibiza, right?). Whilst their menu isn't strictly vegetarian and vegan, it is mostly plant-based, which makes a difference from the usual meat-dominated menus. 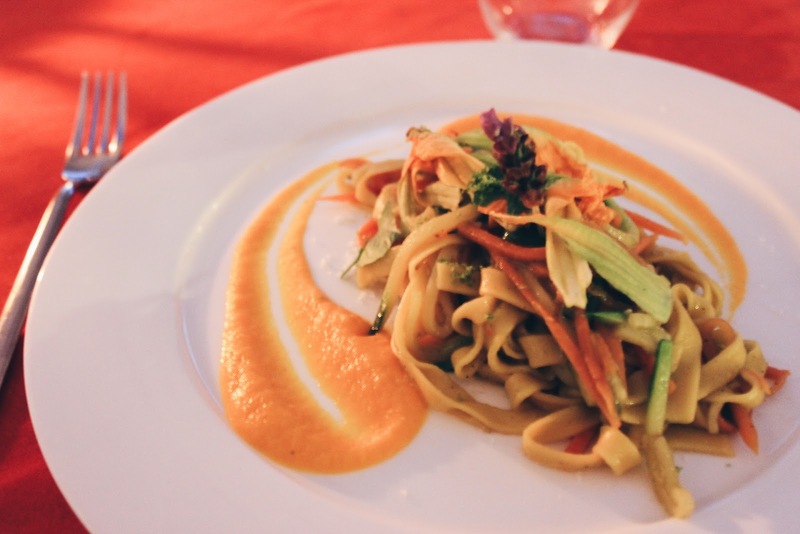 Passion's focuses mainly on vegetarian, vegan, macrobiotic and raw cuisine. However, it isn't all grain bowls, salads and smoothies - although they do offer those if that's what floats your boat - but their menu is incredibly wholesome and they even have a selection of burgers available! I opted for their chilli tofu paired with quinoa salad, goat's cheese, avocado and sweet potato, which was absolutely delicious. A couple of the other girls ordered salads whilst Lauren ordered the mighty vegan burger and they all confirmed that the other dishes were just as appetising! 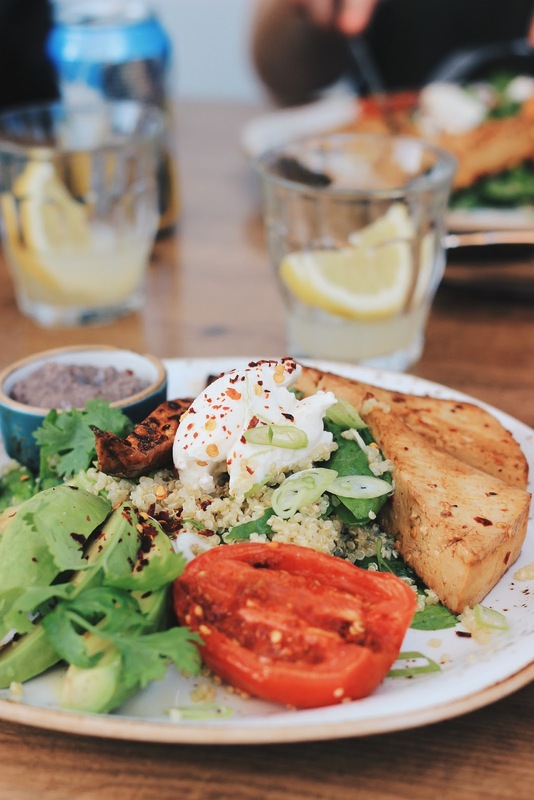 It's the perfect spot if you're travelling in a group of mixed dietary needs and want some fresh, organic food that's bound to make your heart and your stomach feel full! 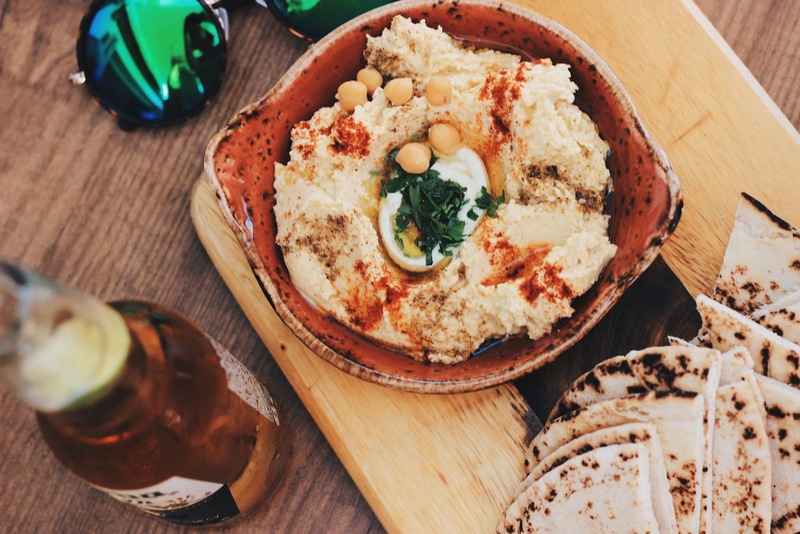 If you do stop by Passion, make sure that you order the houmous for starters, because that houmous is sensational! The second food stop on our Ibizan adventure was Simbiosis (formerly named Out Of Time), which we retreated to after a long day walking around in the blazing hot heatwave, which was aptly named 'Lucifer'. Simbiosis a strictly vegetarian and vegan eatery with organic and fresh local produce that is located in the heart of Ibiza's beautiful Old Town. As we were absolutely ravenous at this point, we took a seat in the shade and scanned the menu furiously with rumbling stomaches. Upon the recommendation of the guy who served us, we all decided upon a minty, pink lemonade which was exactly what we all needed to refresh and revitalise after battling with the unbearable heat all morning whilst trekking to Es Vedrà. 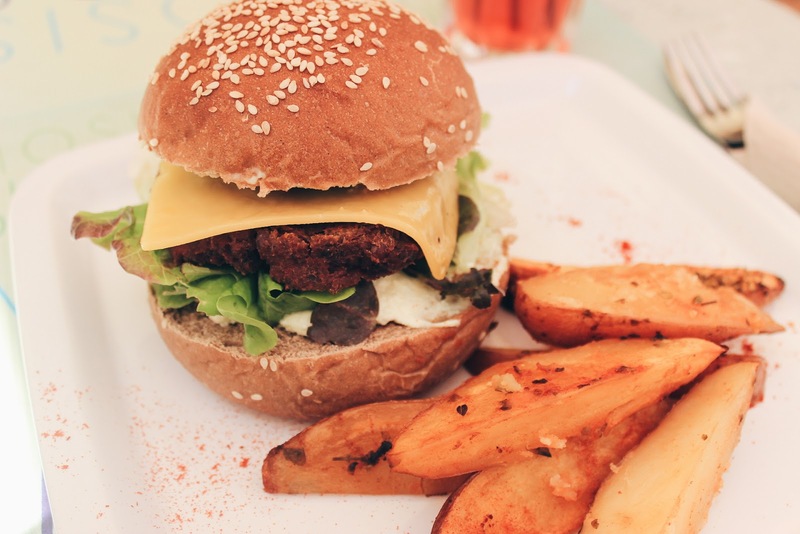 Usually when I'm struggling with the heat, I'll tend to stick to light dishes but I was swayed by the sound of Simbiosis' own vegan burger with vegan cheese and boy oh boy, am I glad that I made that decision! My body was definitely craving the carbs at that moment in time and the burger was exactly what my body needed. Some vegan burgers can be a little questionable (a big mushroom in a bun is not a burger, fyi), but Simbiosis' vegan burger was absolutely incredible! On our final evening we decided to treat ourselves to a slightly more ~fancy~ meal, so we took a drive to the remote Italian restaurant, Can Domingo. To this day I still proclaim as one of the most typically romantic restaurants I've ever been to! 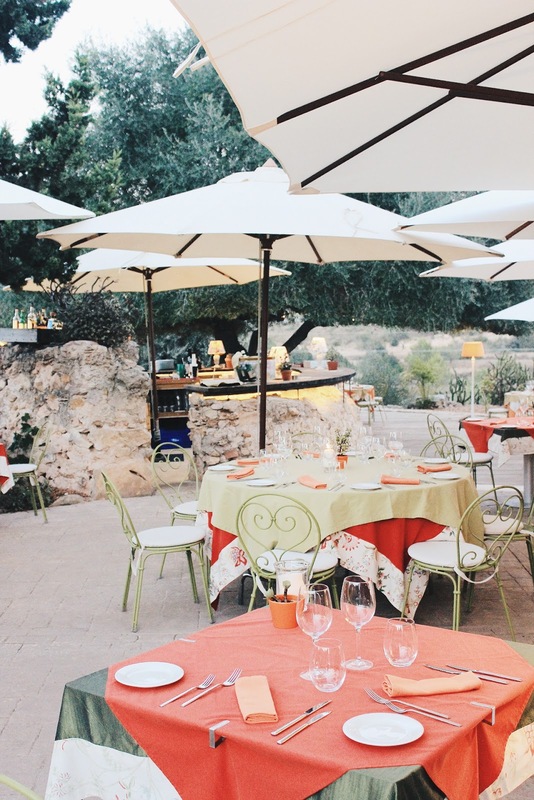 The restaurant itself is tucked away along a dirt road in the rolling hills of the island and the garden looks out to the most spectacular Ibizan rural landscape. 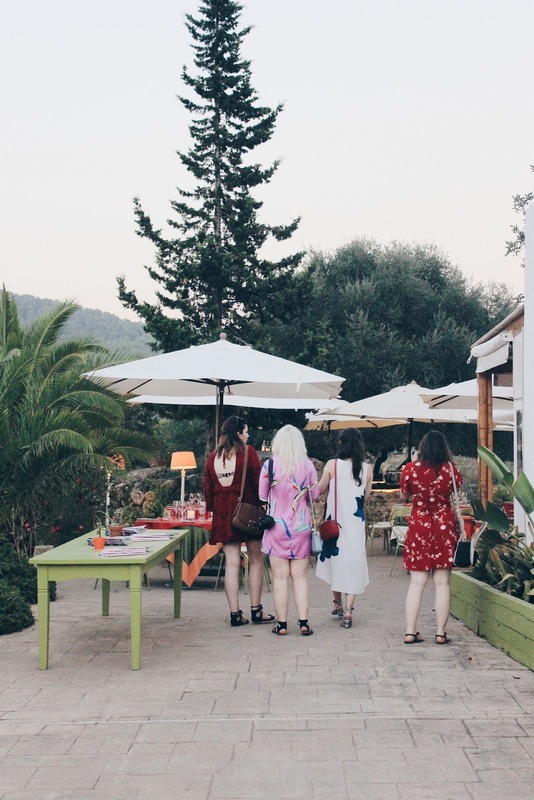 The restaurant itself is within a typical Ibizan finca rather than a typical restaurant setting, so walking into it feels a lot more intimate and homely. As someone who has grown up in the city, it was refreshing to experience something so far from the restaurant settings in London. Whilst the menu at Can Domingo isn't exclusively vegetarian or vegan, it does offer a decent selection of plant-based options, which is rather rare for a traditional Italian restaurant. I had their homemade vegan tagliatelle with saffron, carrot and cardamom cream grated with lemon zest and homegrown herbs. It's also worth mentioning that they also have a pretty persuasive vegan chocolate cake on the dessert menu too! 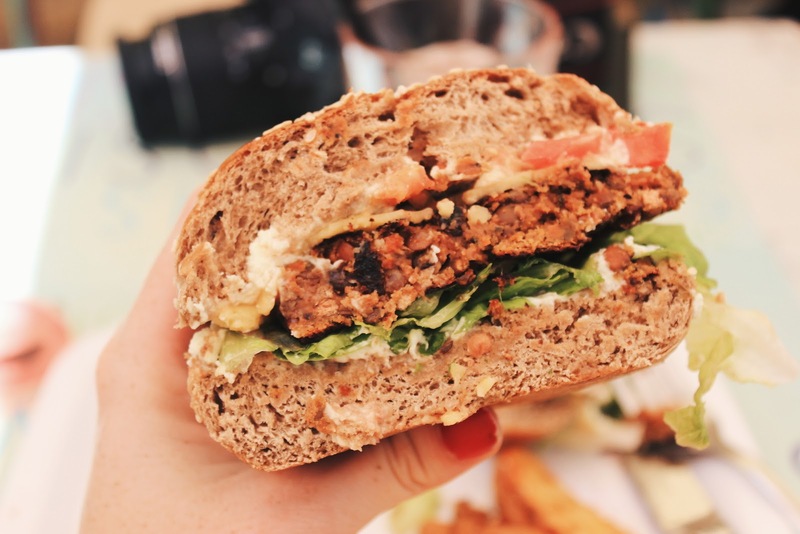 Do you have any recommendations for vegetarian or vegan food stops in Ibiza?